I met a gentleman who approached me because he read about my life coaching services. We had met before and he was following me on Facebook. He was genuinely curious about what happens in life coaching. So we agreed to meet-up for coaching. Let’s call him Randy. He was a 27 year old Interior Designer working in Metro Manila. He had been working for some time as an employee, in a stable job where he was progressing steadily (but slooooowly) through the ranks. A few years back, he and his girlfriend, also in the interior design industry, decided to form their own company. Randy agreed to form the company, despite the fact that he wasn’t ready to leave his day job. As years passed, Randy’s girlfriend took the reins of their company, and continued pursuing new projects left and right. She was a go-getter and was saving up much more than Randy was able to save. Eventually, Randy’s girlfriend went full-time with their company. Randy proposed to his girlfriend a few months before our coaching. They were frantically saving-up and working through wedding preps, with the big day barely 6 months away. As much as he wanted to contribute and help his fiance with the business, he couldn’t give as much due to his commitments and persistent demands of his day job. His job was very much a safe-zone with the consistent and steady pay, but his fiance needed him more to help their business grow. One day, he came across one of my posts on Facebook. Reading the post, it struck a deep chord in his heart. 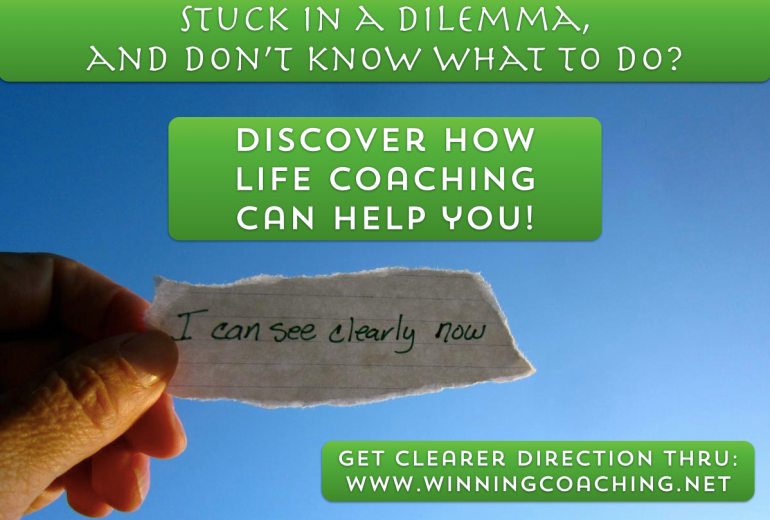 His brain was telling him, “Looks like this is definitely what I need!” He determined that he wanted to talk to me face-to-face and find out more about what life coaching could do to help him. When we started our coaching, Randy had a LOT of things on his mind. If he were a laptop, he was running 25 programs at the same time that it slowed him down, trying to process too many things in his mind. If he were an appliance, he was like a blender crammed with stuff, but the blender was spilling over. He was all over the place. “I wanted to have clarity. I wanted to hear words of affirmation. When he told me about his multi-faceted dilemma: his career, about quitting, about working on their business, about wedding preparations… I knew how I could help him. Our coaching session involved clarifying the different things he was juggling in his head. It was like untangling a huge mess of wires. It was like straightening out the cables, smoothening out kinks, and putting them back neatly into place. Progressively, I could see how Randy was gaining more and more clarity with his thoughts. I could see that some of his thoughts weren’t aligned with his beliefs and his values — in NLP coaching, this is referred to as “incongruence”. And I could also see that some of his thoughts brought him joy and inner peace with himself — this shows congruence. After gaining more clarity with his thoughts and feelings, I guided him in creating a new resolution for his dilemmas. The amazing thing? I did NOT GIVE ADVICE to him. In fact, I did not have to unearth the details of his thoughts, his dilemmas, his situation. All I did was guide him through a process, and he achieved clarity. All the solutions he created were possible because of the clarity which I helped him achieve wink emoticon . And it all made real sense to Randy. If you’d ask me what his solution was — frankly, I couldn’t tell you. Why? Because the solution came from his own thinking. I merely coached him through it. “It was liberating and refreshing altogether. The learning was something different, and I accepted the new learning. He left the session with a much lighter stride, with a clearer “aura” on his face. If he were a laptop, it was as if he purged all his excess files, closed his unnecessary programs, got the hard-drive defragmented, and became laser focused on what action he needed to do. If he were an appliance, he suddenly was a well-oiled machine, geared up and moving forward, knowing what he had to accomplish. All because of a 45 minute coaching session one Sunday afternoon wink emoticon . Many months later, I’m very happy to see that Randy is now married. The business that he and his wife created continues to grow. I see how he is serving the Lord in many ways. And I see how happy he is in many aspects of his life. He wanted someone to understand him better. He got a better deal: He understood himself. Some of you may be wondering how you could get this kind of clarity. Some of you are thinking “this is the right thing for me”. If it feels right, take action. By this time, you’re excited to learn even more about NLP Life Coaching . Satisfy your cravings at http://www.WinningCoaching.Net/ . p.s. Yes, you can share. Yes, you can PM me. Yes, let’s talk soon!